Tools | i can make stuff!! 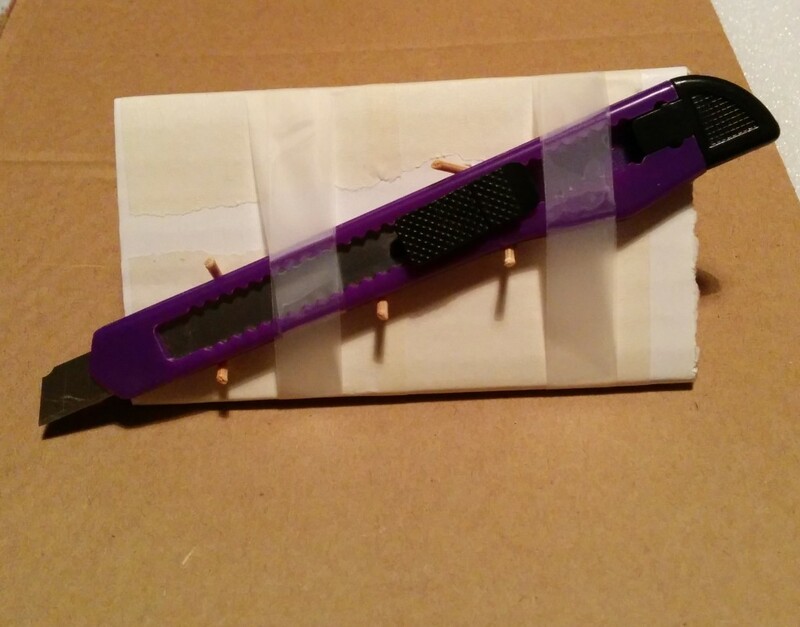 As mentioned previously I made a foamboard cutter to allow me to make consistent and neater 45º cuts. I initially made it out of foamboard itself but have since disposed of it as it was unsuccessful and didn’t give great results. 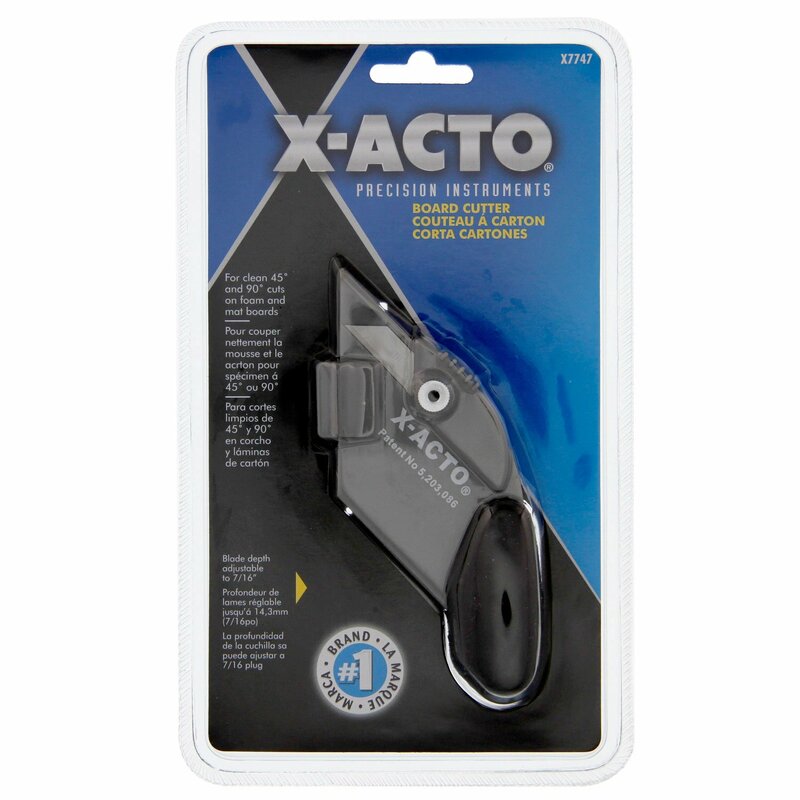 I went with the X-acto X7747 in the end but its worthwhile describing the build process in case it is of use to others to replicate or improve. I have replicated my basic construction using corrugated cardboard and cocktail sticks in place of foamboard and pins. 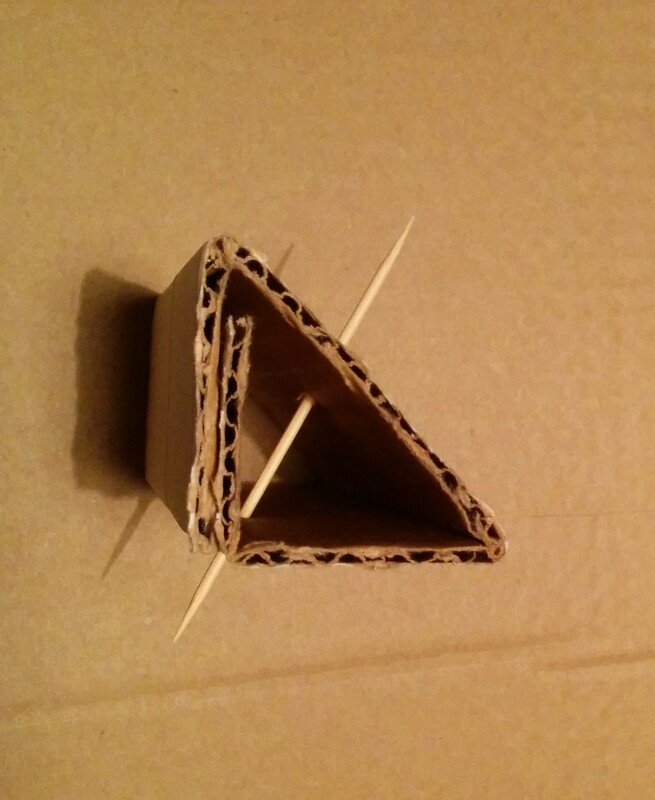 The basic idea is that the folded shape of the cardboard provides the cutting angle and the cocktail sticks help to keep the blade in the same position. 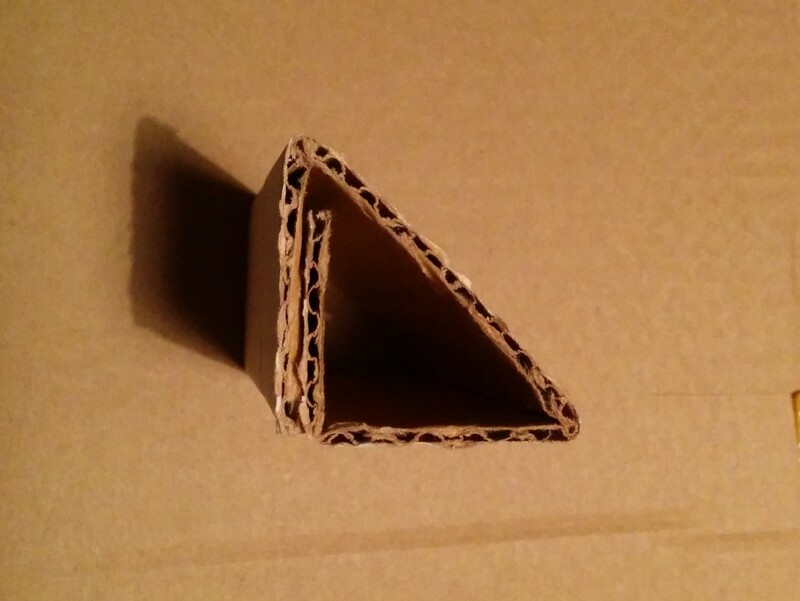 Fold the cardboard to 45º (or any angle you desire). Use a protractor for better accuracy. You may need to take the cutter’s shape into account if the cutter puts its own angle on the blade. My cutter maintains the blade perpendicular to the holders base so no corrections needed. 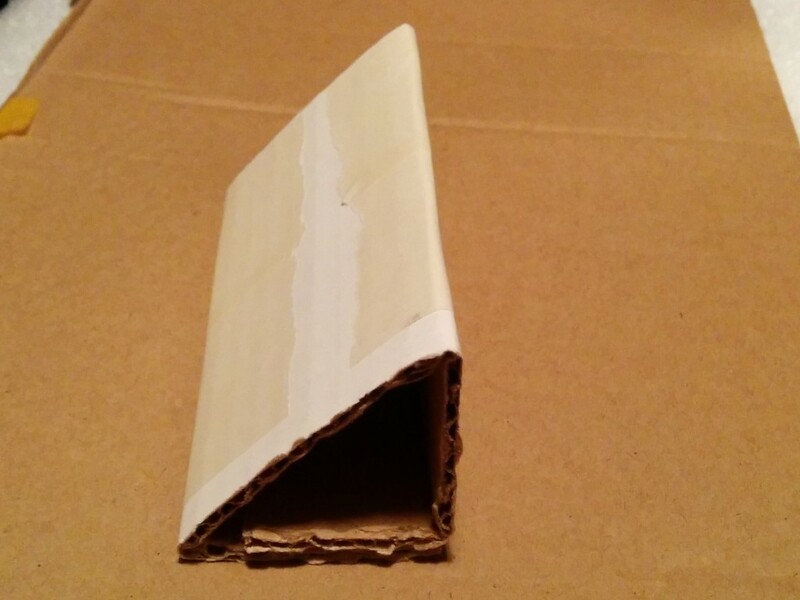 Use tape/glue to hold the folds in place. Insert cocktail sticks to provide a resting place for the cutter. Make sure to push them through to the back aswell. This will provide an anchor point for the cocktail stick and provide a greater resistance to downward pressure on the blade when in use. Mount the cutter on the cocktail sticks and add extra/adjust as required. Once you are happy with the setup, you can trim the cocktail sticks. Secure the cutter to the holder using tape. You are now free to cut at whichever angle you have setup. There is a good bit of scope to improve the design. Using wood to form the base would add sturdiness and using a razor blade mounted via screws would help prevent movement of the cutting blade. 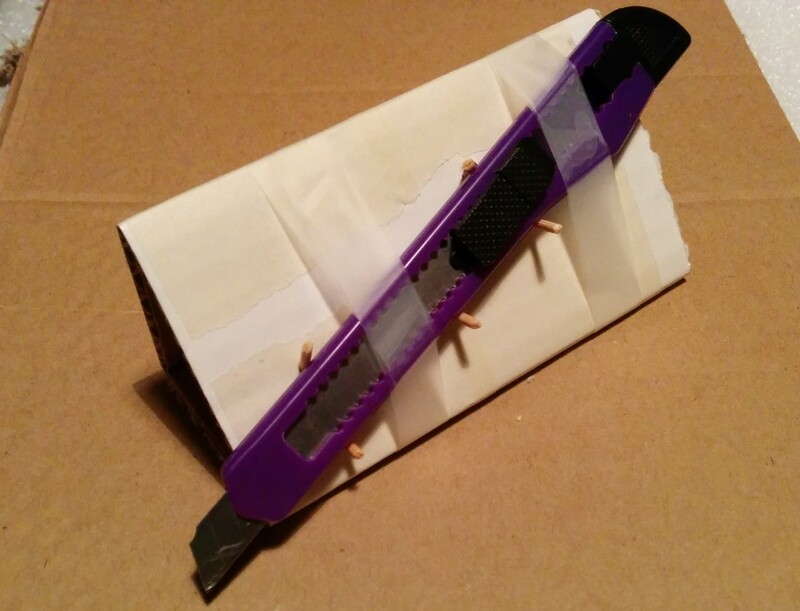 There is also a flaw in the build shown above – the tape at the rear of the cutter blocks the movement of the sliding blade. D’oh! After I had prepared this post but before publishing, I saw this on Hackaday. Great minds think alike!